Today: Give in to fall. Buy that can of pumpkin. Make this cake. I love themed sections of grocery stories. Not The Deli Department or Produce or The Cereal Aisle, though certainly we would all be very lost and hungry without those feats of spatial organization; what I mean, and what I love, is when the store tries to send you a message. Like the leaning tower of marshmallow bags, Hershey's bars, and boxes on boxes of graham crackers at the end of some aisle, precarious and perfect. "Making s'mores this weekend?" the tower asks you, literally blocking out your view of the vegetables. "WELL YOU ARE NOW!!!!" And how can you argue with that shouting mound of convenience? It joined everything you didn’t know you needed together in one place! It would be foolish not to make use of that kind of efficiency! Right? That's why I bought all of those disparate matzo ball soup ingredients in one fell swoop when I'd really only gone to the store for detergent, because I was being efficient? Right? Anybody? In November, the grocery hints stop being polite and start getting real, compounding the glory of fall with the persuasiveness of those ingredient groupings, which are totally and completely irresistible: Stuffing mix and cranberry sauce in a Thanksgiving skyscraper. A monument to pecan pie, all grand spires of crusts and bags of nuts. 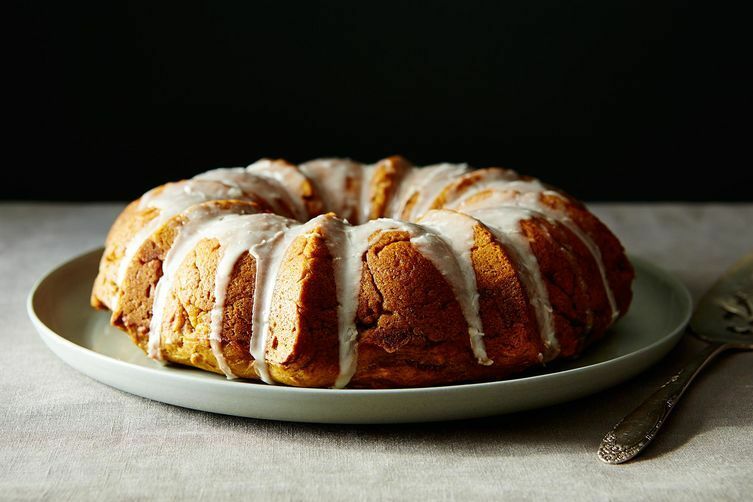 And the reason for this coffee cake: Mount Canned Pumpkin, surrounded by foothills of cinnamon and nutmeg in jars. I could not say no and I could not turn away, so I loaded up my cart, snagged a bottle of maple syrup from The Breakfast Aisle for good measure (conveniently adjacent to that mountain), and hurried home. I commented on this last night and the comment is gone (along with many other bad reviews). This was the worst cake I have ever made. Not sure why there were no eggs, but this was a heavy mess. The crumble was not noticeable, even though I added some walnuts. What a waste. Just made this today, sooo yummy! 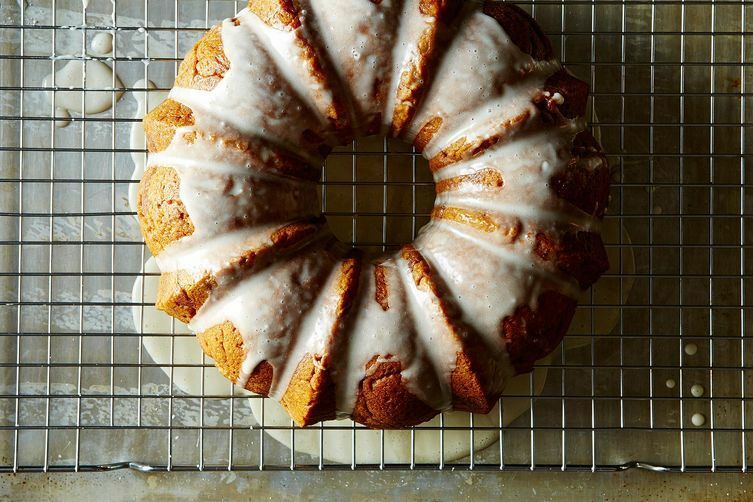 Moist and delicious and pumpkiny. I didn't use much of the glaze, I wasn't going for something too sweet. For some reason, all the comments that were posted on this recipe last week seem to not be here anymore. Y'all, this recipe cooks up like a doorstop. Don't waste your maple syrup. can anything non-dairy be subbed for the buttermilk?